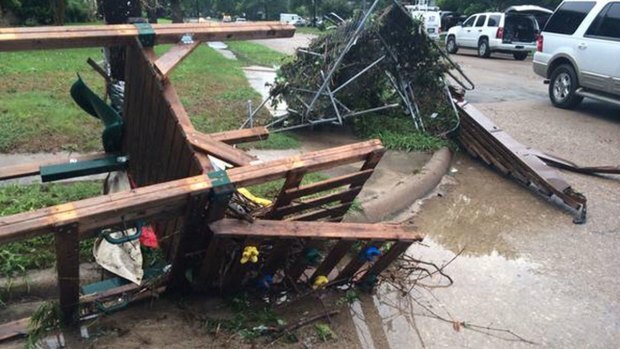 NBC 5 is teaming up with the Red Cross and Kroger to assist Texans affected by severe storms, tornadoes and flooding. People can go to any Kroger in DFW and drop loose change into coin boxes located at every checkout stand. The money goes directly to support disaster relief efforts for the Red Cross Disaster Relief Fund. 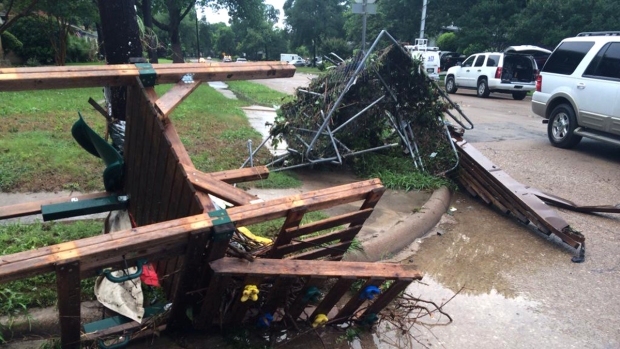 Residents living along Duck Creek in Garland spent the day cleaning up after flash flooding Friday morning. 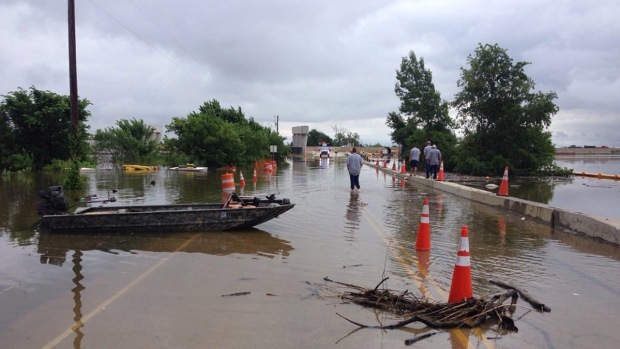 The Garland Fire Department had at least a dozen water rescues from cars and homes. Many people living along Glenbrook Drive in Garland woke up Friday morning to water pouring in their home. Floodwaters strand a Sachse police officer trying to divert traffic and cause damage to several homes in a nearby Garland neighborhood. "It’s about 3:30 in the morning and my wife wakes me up and says there’s water coming in the house," said Allan Pettit. More than a dozen homes on Glenbrook Drive were flooded with several feet of water. "When we looked out the door, a couple minutes later, and it had already risen several inches," said flood victim Abby Hare. "We were like its coming and it's coming fast, so there was barely any time to do anything." Hare has lived in her home on Glenbrook for 16 years. She says there was some flooding in 2006, but says it has never been this bad. "It was almost two and a half feet of water in the house," she said. "Everything was floating around, couches, tables." Daniel Guitierrez, who also lives on Glenbrook Drive, found his car on the other side of the street. Debris litters a Garland neighborhood and many houses are damaged after Duck Creek flooded early Friday morning. "I looked outside the same time it was flooding completely, and I didn't see my car,” said Gutierrez, "Thought it's probably down the street somewhere." Clean up in the neighborhood brought out friends and family to help neighbors hit by flash flooding and overflow from the Duck Creek. 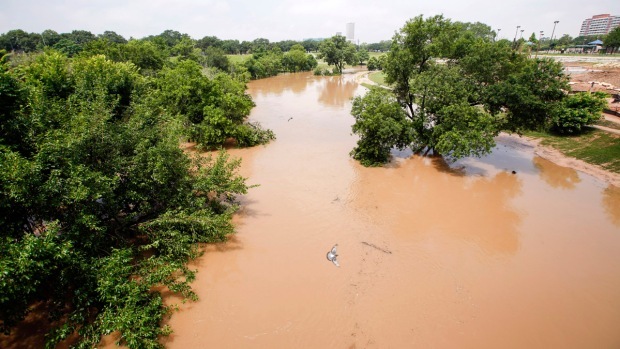 "There was water probably 18 inches [of water] which is kind of weird," said Pettit. "It’s like an aquarium in your back yard." Neighbors say the water rose quickly. But just as soon as it came, it receded. "The water is coming up and we're trying to move stuff upstairs and I’m going around in my rain boots and it keeps coming quick," said Abby Hare. Now folks have the tedious process of removing ruined belongings one by one. All the families we spoke with have remained positive, despite the damage, and are glad no one was hurt. "God has our back and he will definitely take care of us,” said Hare. "We have friends in our lives that will help us clean up the wreck." Many of the families we spoke with did have flood insurance. NBC 5 is teaming up with the Red Cross and Kroger to assist Texans affected by severe storms, tornadoes and flooding. People can go to any Kroger in DFW and drop loose change into coin boxes located at every checkout stand. The money goes directly to the Red Cross Disaster Relief Fund.